A double-drive wheel has one whorl on the bobbin and one whorl at the rear end of the flyer shaft. These whorls have different diameters (measured in the groove). The drive band is folded into a figure 8 and looped over both whorls (i. e. two loops of the drive band are running over the drive wheel, and one loop over each whorl). 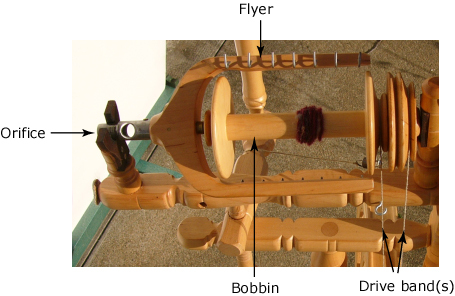 The different-size whorls make the bobbin and the flyer turn at different speeds. This means twist and take-up happen at the same time, continuously and at a fixed ratio. In order to reduce take-up you need to increase slippage, meaning you reduce drive-band tension (metal screws allow finer adjustment than wooden screws). As the bobbin fills, take-up needs to be increased, meaning you need to adjust drive-band tension. In theory, the continuous take-up and fixed ratio between take-up and twist allow spinning very regular yarns. The continues take-up also makes for smoother short-draw spinning (where you frequently feed in small amounts of yarn). There is no brake, therefore no additional friction to make treadling harder than necessary. Some absolutely beautiful wheels on the market today are double-drive wheels. It's the most difficult wheel to build - the ratio between the two whorls is essential, the form of the groove is important and even the material and diameter of the drive-band influences the wheel's behaviour. When you buy an old wheel off E-Bay (or similar) you run the biggest risk: If not all parts are original the wheel can be unusable. Same thing if somebody built the wheel who doesn't really understand the double-drive system. If a wheel builder sets up his new double-drive wheels with two drivebands (instead of one continuous loop) I'd test the wheel VERY carefully before buying! You need to remove the flyer whorl for changing bobbins. The double drive band can be quite difficult to loop correctly around whorls and drive wheel. It may be difficult to reduce take-up as much as you'd like. This is the wheel that's least suited to long-draw spinning. Explanation: For long-draw spinning you want at first no take-up at all, and then long pieces of yarn in one go - the exact opposite of the double-drive wheel's continuous take-up. As the system is somewhat more complicated I'd not necessarily recommend it for beginners. Fine yarns. Thick yarns are possible if the wheel has a low-enough ratio, but bobbins on today's commercially available double-drive wheels are so small that you'd have to change them every half-hour, which takes the fun somewhat out of spinning. Production spinning, where you want to produce large quantities of regular yarn quickly. I'm perfectly capable of spinning irregular yarn with a double-drive wheel - so that's one advantage I can't make use of. I'd hesitate to buy a double-drive wheel without scotch-tension option as my only wheel - just in case. But then, most of today's double-drive wheel do also have a scotch-brake, and on an old wheel you can probably rig one.